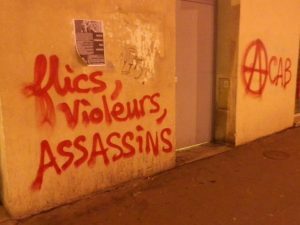 Revolts have been spreading throughout Paris’ northern suburbs in the past week, in reaction to an extremely vicious police assault on Théo, a 22 year-old black man, who is still in the hospital. What follows is a collection of excepts translated from different (movement) texts and (mainstream) news articles currently circulating to give a sense of this wave of rebellion.Although things seem to be quieting down a little, bus service is still cut through the neighbourhoods after another night of rioting and at this moment a hundred or so people are kettled in Paris demonstrating against the police. 25 more youth were arrested this morning for rioting. The first excerpt describes the assault and so involves descriptions of physical and sexual violence, as a heads up. All links are to source texts. 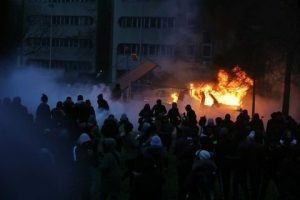 Translators intro: This article really wants to insist on the actions of the police being illegal and on the problem being “police impunity”, not policing itself. But in spite of these weaknesses, it’s still worth reading and discussing. Although this kind of discourse is annoying, here the talk of legality can be understood a bit differently, because the police aren’t just any group of people. Of course, the police break the law all the time — the law is a weapon in their hands, not something that binds them, and as anarchists we shouldn’t uphold the myth of the just (or the accountable) cop. But it is worth noticing when a mass of police feel that they can openly break the law, disobeying the minister of the interior, to march armed on government buildings at night. From 6:30 in the morning, high school students were already throwing down. Some short reports are available here. At 11am, there was supposed to be a secret meetup with some high school groups at Nation square, but the cops found out about it: tons and tons of pigs all over the square. While some demonstrators got kettled, about 200 of us (mostly higschool students or youth) regrouped in front of Helene Boucher school on Cours de Vincennes and decided to take the metro to Lyon Station.